Built in 1890, it sits on 4.5 acres and is home to Cogswell Tower, Central Falls' most prominent feature. This "city beautiful" park provides both active and passive recreation and scenic views of the surrounding landscape from Cogswell Tower. The Tower is open to the public periodically throughout the year during City events in the park. Having undergone a complete renovation in the fall of 2017, Veterans Memorial Park now combines land from the old VFW Post that was taken down along with a prior smaller park. The Post's two cannons were refurbished and mounted on either side of a waterfall memorial hoisting the flags. A plaque donated to the park by the class of 1966 is mounted honoring members of all five military branches of government. The park also includes a walking path and a splash pad for residents to play and cool off in the summer. More images here. This park, named for Central Falls High School-graduate and Rhode Island Governor Lincoln Almond, is a one-acre fitness park with state of the art playground and exercise equipment and a walking path. Additional features include access from Crossman Street to Earle Street, a multi-use lawn, fruit trees and bushes, and parking for twelve vehicles. 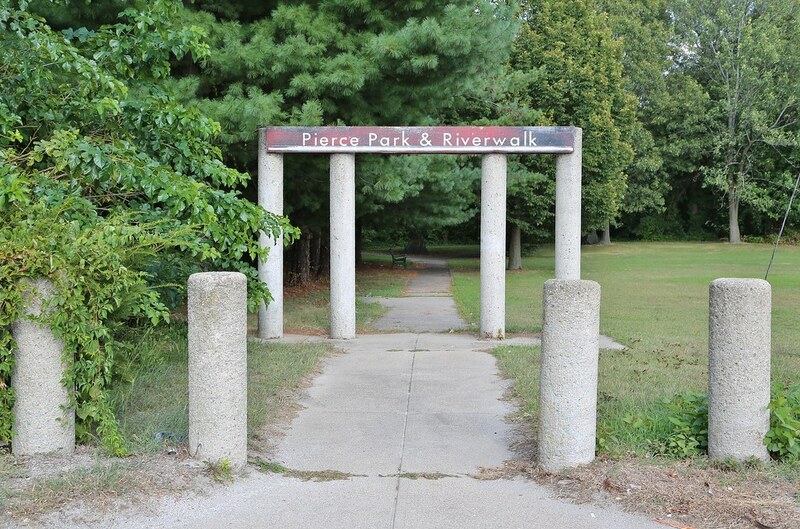 This 2.5-acre park features an 1/8-mile walking track around a multi-use lawn with a foot bridge crossing over to "River Island" in the Blackstone River and offers scenic and passive recreation. Rhode Island's only urban campground is located on the island and is available for reservation. Before, this site was an abandoned house. Then a vacant lot. 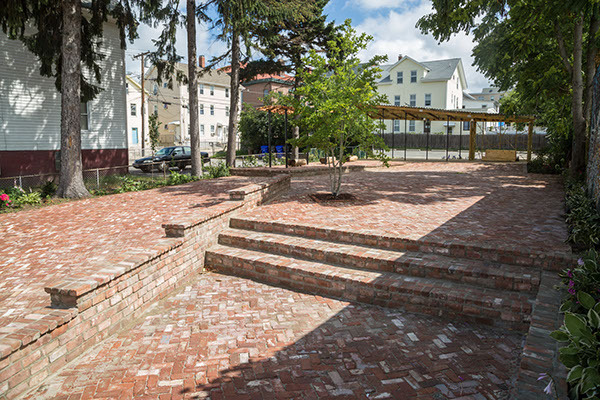 Today, it's a beautiful brick-terraced plaza, complete with stage, shade pavilion, and mural made from tile contributions of the community. Thanks to the incredible work of Rhode Island School of Design's Desine Lab, Javeriana University, and the city of Central Falls, RI! Chocolate Mill Overlook is a park located on the banks of the Blackstone River in Central Falls, Rhode Island that celebrates one of North America's earliest water-powered chocolate mills. There is parking for two vehicles, informational signage, and a bicycle repair station. This site pays homage to en epic battle between colonists and Native Americans. This riverfront part includes Saul Tarlow Little League Field, benches and a 1/4-mile trail along the historic Blackstone River. This 1/4-acre playground is used heavily all year and is home to the Central Falls Farmers Market from June through August. This one-acre playground has playground equipment and a basketball court, along with parking for twenty vehicles. In 2016 a dog park was added with separate spaces for large and small dogs. The Coutu Memorial Park is dedicated to Chief Robert A. Coutu and Chief René R. Coutu of the Central Falls Fire Department to recognize their numerous contributions to the city and their department. Home to the Central Falls High School football, soccer, baseball and softball teams, this multi-sport complex is used from April through November for various sports. This 8.3 acre multi-sport complex features a baseball field, two basketball courts, a football field,a soccer field and a 3/4-mile track. The facility is used from April through October for various sports.